▲ Figure 1. 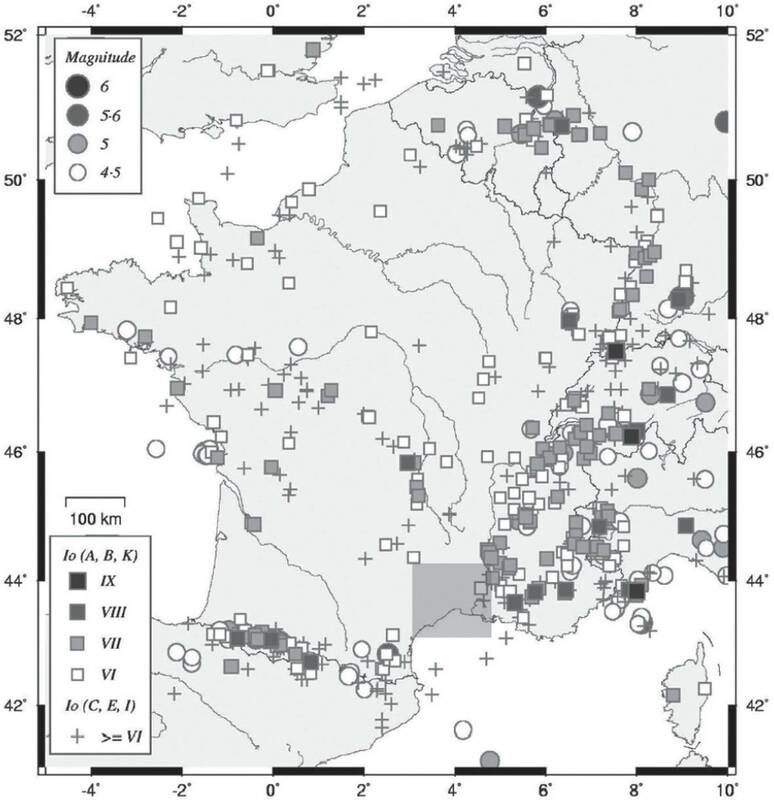 The studied area (highlighted) in the context of the historical and instrumental seismicity of France (from Scotti et al. 2004). Uzège, or Pays d’Uzès, is the name of the area surrounding Uzès, a town in the administrative department of Gard (southeastern France). Uzès, which stands on a hill towering over the banks of the small river Alzon, approximately 20 km northeast of the department capital, Nîmes, is very ancient. The Romans settled there around the 1st century BC and, not long after, they started building a 50-km-long aqueduct intended to supply the town of Nemausus (now Nîmes) with water tapped from the nearby Eure springs (Provost 1999). By the 5th century AD, the original Roman camp had grown into a town, an important stop on the Lyon-Nîmes roadway and—Christianity in the meantime having become the established religion— a bishop’s seat. In the Middle Ages the bishop of Uzès was a powerful dignitary, and his diocese was one of the largest in southern France. Uzège was a thriving district renowned for its pottery and weaving factories (Pélaquier 2007). During the Renaissance, many Uzètiens turned to Calvinism and Uzès became the fifth-largest Huguenot town in France. The religious wars of the late 1500s caused much devastation to local churches and their archives; further destruction, both of buildings and historical records, occurred at the end of the 18th century during the French revolution (Dumaine 2008; Venturini 2006). In 1801 the French Republic and the Papacy resumed diplomatic relations after the revolutionary upheavals by stipulating a concordat under which the Uzès bishopric was suppressed; the town then dwindled into a provincial backwater, from which fate it has been rescued in the past few decades by French and foreign visitors attracted by its natural and manmade beauties and laid-back lifestyle (Susplugas 2010). The Gard department is part of the Languedoc-Roussillon region of France. According to the French macroseismic database (SisFrance 2010), this region does not have a high level of local seismicity (Figure 1). However, placed as it is between two more seismically active regions, the Pyrenees and Provence, Languedoc-Roussillon is liable to be affected by large earthquakes that originate elsewhere; the latest such to date was the St. Paul-de-Fenouillet (Pyrenees) 1996 earthquake (ML 5.2 according to Rigo et al. 1997). Earthquake-wise, Gard stands out among the departments of Languedoc-Roussillon for its particularly weak and sparse seismicity. The extant SisFrance (2010) Gard earthquake catalog starts with a shock felt in Uzès in 1186 (intensity and epicentral location unknown), includes only one slightly damaging local earthquake (1946, epicentral intensity 6–7 on the MSK- 1964 scale), and associates the maximum macroseismic intensity on record in the area with an extra-regional event, the 1909 Lambesc (Provence) earthquake, the strongest event located in metropolitan (i.e., mainland) France during the last century (epicentral intensity 8–9 on the MSK-1964 scale). The new seismic zoning of France, issued on 1 May 2011, grades the seismicity of the Gard department as moderate to weak (Plan Séisme 2011). This thumbnail sketch of Gard seismicity would not be complete without at least mentioning that a recent study of the Uzès-Nîmes Roman aqueduct, Volant et al. (2009), has hypothesized a connection between some archaeological evidence of damage undergone by a section of this artifact and the possible occurrence of one or maybe even two major earthquakes (M ≥ 6, type of magnitude undefined) in the 3rd or 4th century AD. Even if this assumption is not supported—so far—by documentary evidence nor by the findings of the only extensive overview of historical earthquakes available for the period (Guidoboni 1989), it reminds us that the current picture of generally low regional seismicity is a target for improvement. This paper describes a case in which a major improvement has been made possible by one of those lucky chances that sometimes occur to historical seismologists. As shown by a comparison of its seismic history with those of nearby towns such as Nîmes and Alès (Figure 2), Uzès appears to be one of the less seismic towns of the whole Gard department. In fact, however, we are now able to show that its territory was the setting of the most significant local earthquake of the last millennium, though the actual import of this event has remained ignored until now, owing to the lack of historical evidence in situ. 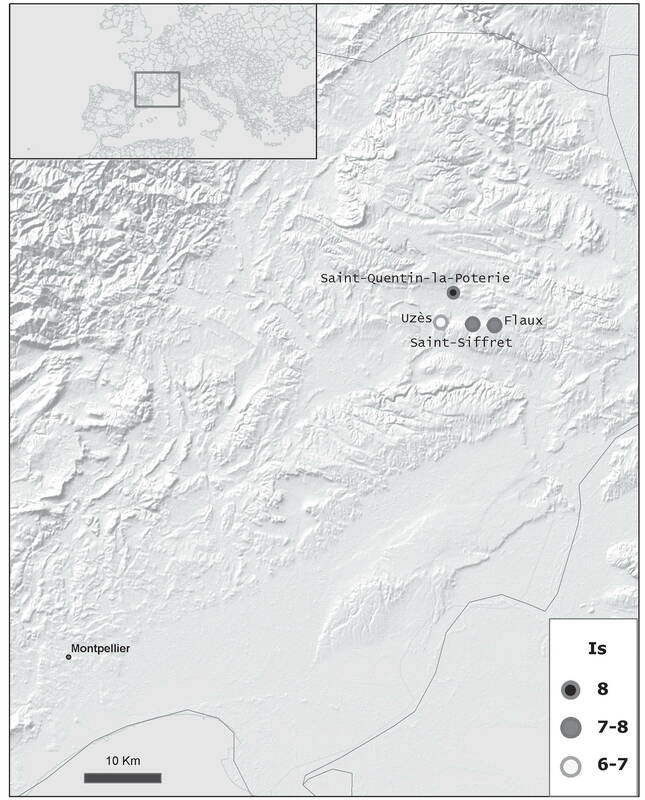 Thanks to the accidental discovery of a previously unknown contemporary source, preserved very far from the place where it was originally written, it is now possible to significantly revise the 1186 earthquake dataset by providing reliable evidence of relevant damage incurred by settlements less than 10 km northeast of Uzès. The discipline commonly called historical seismology springs from a centuries-old tradition of historical earthquake data collection for the sake of general knowledge, which a great many European intellectuals were engaged in from as early as the mid-1400s. The earliest mention of the 1186 earthquake in this seismological tradition occurs in a collection of information about earthquakes and other unusual facts compiled by a 16th century Alsatian humanist (Lycosthenes 1557). It concerns an earthquake that occurred in Gothia (an ancient name for Bas-Languedoc) on Mid-Lent Sunday of the year 1185, and a lunar eclipse that followed it in April. The 19th century French seismologist Alexis Perrey (Perrey 1845) conflated this item of news with others, derived from 16th and 17th century reference works and editions of medieval chronicles, into a garbled description of an earthquake whose occurrence in 1185 he took for granted, but about whose location he avowed to be uncertain: was it in “Gothia” or “Gothis” or perhaps even in “Greece”? And was the affected town (“Ucericum” or “Uceticum” according to the texts he quoted) to be identified with Uzès or not? Similar doubts were voiced in the Mallet and Mallet (1858) earthquake catalog. 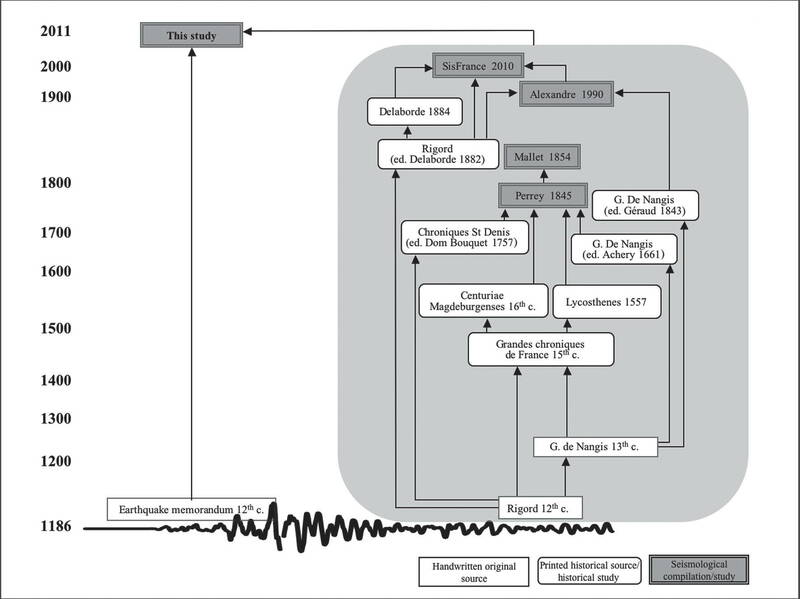 A scholarly study of Western European medieval earthquakes (Alexandre 1990) solved the puzzle by going straight back to the start of this tangled informational skein (Figure 3). As far as the seismological tradition is concerned, the 1186 earthquake story begins with a contemporary chronicler (Rigord 12th century), who recorded an earthquake felt in Uzès, Gothia (i.e., Bas-Languedoc) on Mid-Lent Sunday and followed, after a couple of weeks, by an eclipse of the moon. In Rigord’s own words, this happened in the year 1185, just as reported by Lycosthenes (1557) and Perrey (1845). But, as Alexandre (1990) points out, this is not really 1185 but “1185 according to the calendrical style of the Incarnation.” In other words, Rigord did not reckon his dates taking January 1 as the starting point of the legal year (as in the modern usage and in the Julian calendar as fixed in 45 BC); he started instead from March 25, the feast of the Annunciation to the Virgin Mary. According to the style of the Incarnation, widespread in contemporary Europe, March 24 is the last day of one year, and March 25 the first day of the next. Thus, Mid-Lent Sunday of the year 1185 (Incarnation style) corresponds to March 23 of the year 1186 (modern style). Taking into account this quirk of historical lore, there is no doubt that the likeliest source for the 1185 news item reported by Lycosthenes (1557) is, directly or indirectly, Rigord’s contemporary chronicle. Rigord (~1150–~1209) was a native of Bas-Languedoc who moved north around the year 1189 and became a monk in the abbey of Saint Denis, near Paris, then the center of official French history-writing. Rigord styled himself “regis Francorum chronographus” or historian of the French king (Delaborde 1884), in which capacity he wrote up the deeds of Philip Augustus, king of France, from his coronation in 1179 up to 1206. His chronicle is strictly focused on the king’s doings and rarely, if ever, mentions anything that is wholly unrelated either to the king or to Saint Denis abbey; the 1186 earthquake episode is one of very few departures from this general rule. According to Rigord’s biographer (Delaborde 1884), this very fact shows that Rigord was particularly interested in Uzège; either—Delaborde speculates—because he had been born somewhere near or possibly because he was still living in the area at the time when the earthquake occurred. According to Delaborde, Rigord’s is the only known contemporary account of the 1186 earthquake. Later on, an almost verbatim copy of Rigord’s account was inserted in another Saint Denis chronicle (Guillaume de Nangis 13th century); most of the scribes who copied it seem to have believed that the name “Gothia” (Bas-Languedoc) must be a mistake for “Graecia” (Greece) and to have accordingly corrected it, thus paving the way for the transportation of the 1186 earthquake to Greece on the part of Perrey (1845) and Mallet and Mallet (1858). As Figure 3 shows, all the 16th and 17th century citations of the earthquake mustered by Perrey (1845) can be traced back either to a 15th century printed collection of the Saint Denis chronicles (including those by Rigord and Guillaume de Nangis) or to early editions of the same. ▲ Figure 2. Seismic history of (A) Alès, (B) Uzès, and (C) Nîmes (from SisFrance 2010). As it happens, Delaborde was wrong in believing that Rigord’s was the only contemporary account of the 1186 earthquake. One of the authors of this paper found another such account in the codex Vat.lat.1972 of the Vatican Library (Earthquake memorandum 12th century). Codex Vat.lat.1972 is described by Nogara (1912) as a 12th century miscellany that includes an early copy of Peter Comestor’s Historia Scholastica, a standard Biblical history composed not later than 1178 (Ghellink 1911); consequently, the codex itself must have been written not long after that date. In the one thousand one hundred and eighty-fifth year of our Lord’s incarnation, eleven days before the Kalends of April, it being a Saturday, the twentyeighth day of the lunar cycle [22 March 1186] there was a great and recurring earthquake in Uzès [and] the adjoining castles and villages, so strong that in the castle of St. Quentin almost all the houses either fell down or were split open, causing people to die in their ruin, and the church was damaged too; the village of St. Siffret was ruined, and its church damaged, the village of Flaux was ruined too and its church was damaged. An awful subterranean noise heralded the shock[s], as if the earth itself was bellowing out. Eight days later, awful flashes of lightning were seen in the air, not in a single place but in several ones; and on the fifteenth day [from the start of the earthquake] there was a lunar eclipse; on the following day [6 April 1186], just as the ninth lecture was being read in St. Théodorit’s [Uzès Cathedral] an awful noise was heard and another strong earthquake shock was felt. This sixteenth day [from the start of the earthquake] was Palm Sunday. Short as it is, this text is packed full with data, both on the earthquake it describes and on its anonymous writer. Let us see just how much information we can wring from it. ▲ Figure 3. The progress of information on the 1186 earthquake, from its occurrence to the present times. Whoever wrote the memorandum was the owner of a costly parchment codex, highly literate, interested in scriptural, theological, and legal matters and conversant with the church calendar and the phases of the moon. In short, this was written by a cultured person and most likely—given the range and kinds of interests indicated—a man (though female literacy was by no means unusual in southern France during the 12th century) who seems to have been very up-to-date on what was going on in Uzès and in the surrounding territory, as well as on the minutiae of day-to-day liturgical worship in the cathedral of Uzès. The easiest assumption is that he was a cleric of rank, possibly an administrative officer of the Uzès diocese, if not actually the bishop himself. The most likely place in which the memorandum could have been written is Uzès itself. The reason for believing this is that the memorandum mentions the church of St. Théodorit without bothering to explain where this church is located. St. Théodorit was the cathedral of Uzès (Germer-Durand 1868), a detail that only a resident would have taken for granted. The exact date on which the memorandum was written is unknown, because the author did not think of writing it down, any more than he did for his other notes, but a likely time-window for its writing can be defined. It was certainly not earlier than 6 April 1186 (the date of the last described episode) and— but this is very speculative indeed—it could have been earlier than 21 April 1186, on which day a partial eclipse of the sun was visible in the area (NASA 2009). Had the memorandum been written later than 21 April, it seems likely that the writer would not have neglected to add the solar eclipse of that day to his list of unsettling phenomena, as he had done with the lunar eclipse occurred on 5 April. What is described in the memorandum is an earthquake that took place between 22 March and 6 April 1186, caused severe damage in three lesser settlements a few kilometers east of Uzès, and was followed by perceptible aftershocks (the adjective “frequens” can be translated as “repeated” or “manifold”). It is pointless to wonder to what purpose the memorandum was written; what really matters is that it was written at all and to what extent we can rely on it. Just by way of speculation, we could argue that a damaging earthquake must have been so very unusual an event to anyone living in the area that it was worth mentioning, even by someone who was not a professional historian. After all Rigord—who was a professional historian— must have thought exactly the same way, as he departed from his custom of reporting only the king’s deeds and found space in his chronicle for a rare event in his homeland. The reliability of the memorandum can be gauged by cross-checking the facts it narrates and the time-references it provides with those to be found in other contemporary and independent written sources. The occurrence of the earthquake itself is unquestionable, it being testified to by two contemporary witnesses independent of each other, i.e., the author of the memorandum and Rigord. The chronological benchmarks provided by the memorandum are remarkably consistent, and they are consistent with those given by Rigord as well (see Table 1). The only point on which they disagree is the sequence’s starting date on 22 March, according to the memorandum, or 23 March, according to Rigord. We assume 22 March to be the correct starting date of the 1186 seismic sequence, because there can be little doubt that the author of the memorandum was an eyewitness and that he wrote the memorandum not very long after the facts he relates, while Rigord (who may well have been in the area when the earthquake occurred) could have written about it at a later time, thereby incurring in a slight dating error. Concerning the date of the earthquake, it should be noted that the memorandum author reckoned the date of the year according to the already mentioned style of the Incarnation, in which 22 or 23 March of the year 1186 (modern style) was considered as still belonging to the year 1185. That the earthquake really occurred in 1186 is confirmed by two other ways of year-reckoning also employed by Rigord, i.e., by the year of age (21) and the reigning year (sixth) of Philip II Augustus, king of France. This sovereign was born on 21 August 1165 and crowned on 1 November 1179: therefore the only month of March included within his twenty-first year of life and sixth year of reign is March 1186. It remains only to be noted that all the chronological references included in the memorandum and related to the Christian liturgical calendar (festivals such as Palm Sunday), to the Julian calendar (kalends, nones) and to the lunar month have been found to be correct (Cappelli 1983), and that the occurrence of a lunar eclipse on 5 April 1186—as reported by the memorandum, by Rigord, and also, incidentally, by the English chronicler Gervase of Canterbury (12th century)— is confirmed by the NASA lunar eclipses database (NASA 2011). The 1186 earthquake included one main event (“terremotus magnus”) that took place on 22 March, several quite perceptible shocks (“terremotus … frequens”), and a final strong shock that was felt in Uzès on 6 April 1186, while the Mass of Palm Sunday was being sung, i.e., probably toward mid-morning. The main event wrought heavy damage in Saint-Quentinla- Poterie (“castellum beati Quintini”) and in the villages of Saint-Siffret (“villa beati Siffredis”) and Flaux (“villa de Flaus”), which lie less than 10 km east of Uzès (Annuaire des Mairies et Villes de France, 2004–2011a–d); for the identification of the sites see Germer-Durand (1868). The memorandum also explicitly affirms that the earthquake caused unspecified damage to other unnamed castles and villages (“in castellis et villiis”). The available information does not allow us to ascertain whether the sites singled out for description were the most heavily affected ones or simply those about which the writer had more detailed information. Saint-Quentin-la-Poterie seems to have been the most heavily affected among the sites singled out for description; according to the memorandum almost all its houses (“fere omnes domus”) and the church were damaged. The two Latin verbs used to describe the effects in Saint-Quentin-la-Poterie (“ruo,” i.e., “to fall,” “to collapse”; and “scindo,” i.e., “to split,” “to crack open,” “to rend”) imply a gradation of effects: some buildings were damaged but remained standing while others collapsed outright, killing an unspecified number of inhabitants. The effects in Saint-Siffret and Flaux are described in more generic terms: In both cases the verb “scindo” is employed to describe the damage undergone by the village church, while the more ambiguous verb “corruo” (translatable as “to damage/ ruin” or “to fall”) is applied to the settlement as a whole; in either case no casualties are mentioned. What the memorandum does not tell us is whether Uzès itself was damaged by the earthquake. Given the short distance between Uzès and three severely affected sites, it is at least possible that the town itself was damaged, either to a lesser extent or in a less easily detectable way than Saint-Quentin, Saint-Siffret, and Flaux. Conceivably, the more dramatic effects recorded in the latter three sites would have upstaged any slight damage (such as cracks, fissures, or the occasional fall of tiles, cornices, and the like) that could have occurred in the episcopal town. Could further contemporary written records of the 1186 earthquake still be awaiting discovery? Systematic extended searches would not have been within the scope of this study. As a compromise, we attempted to define the potential field of investigation, to evaluate the prospects of success of an ad hoc investigation, and to examine such sources as lay within our reach. Let’s start from the division, familiar to all historians, into documents and narrative sources. Documents are produced for administrative reasons and can be stored in local and non-local archives. There is little hope of finding many such records on site, because the Uzès diocese archives were destroyed during the French Revolution (Mme Marie-Hélène Naval, archivist of the Nîmes-Uzès-Alès diocese, personal communication, 12 December 2011), but, in principle at least, an extensive targeted search of the Gard department archives and the French Archives Nationales could be attempted. The main non-local repository for 12th century Western European documents is the Vatican archives; the first pontiff to adopt a “consistent archival policy” was Innocent III in 1198, and the registers of 12th century papal letters have long since disappeared, but there are copies of previous letters in the extant registers (Boyle 1972). So, again in principle, a search could be instituted there, too. As for narrative sources, i.e., chronicles and other writings produced with the express aim of handing down the remembrance of things past, the great European collections of medieval chronicles printed in the 19th–20th century have been already extensively perused—particularly by Alexandre (1990)—without yielding any more data to add to the already discussed ones. It seems therefore advisable that further surveying of narrative sources should be primarily addressed to narratives, local or otherwise, either published in less obvious repositories (provincial learned periodicals and academic proceedings come to mind) or even still unpublished, if any such are still available. The sources we looked up—without finding any relevant information in them—include the printed collections of papal records available for the 1186–1198 period (Wattenbach and Jaffé 1888), a few contemporary Provençal, English and Italian chronicles (Benedict of Peterborough 12th century; Chronique romane 12th century; Gervase of Canterbury 12th century; Ralph of Coggeshall 12th century; Ralph of Diceto 12th century; Roger of Howden 12th century; Caffaro et al. 12th–13th centuries), and standard reference works on Nîmes and Languedoc that include transcriptions of medieval archive records (Ménard 1750; Germain 1838; Vic et al. 1842). Our decision to consider English chroniclers was motivated by the ties that existed between southern France and the English ruling family in the late 12th century. The English queen consort of the time was also, in her own right, the duchess of Aquitaine (southwestern France); the heir apparent to the English throne was actually in the area in 1186, engaged in a war against Raymond V, Count of Toulouse and overlord of Uzège. Unfortunately, to quote verbatim the reviewer of this paper, “English chroniclers of this period are usually not very good at reporting even their own earthquakes, and if they do mention a foreign earthquake, it’s normally one that is striking news with many thousands killed.” In this case, too, they lived up to their reputation. In early September 2010 we took a short field trip to the 1186 earthquake area, with the aim of seeing the lay of the land and looking for traces of the event we had been studying. The trip took us northeastward from Nîmes, over karstlike plateaus and the scrublands locally called garrigues, to Uzès and beyond, in the midst of a wide expanse of low-lying farmland dotted with ponds, intersected by tiny watercourses, and bordered by wooded ridges. Saint-Quentin-la-Poterie, perched on a pointy hillock some 6 km north of Uzès, is a small town (2,994 inhabitants, according to the last census; see Annuaire des Mairies et Villes de France 2004–2011b) whose buildings have a homogeneous 18th century look. The oldest of them is the parish church, which goes back to the late 9th–early 10th century but was rebuilt and enlarged in the 13th century, possibly as a consequence of damage caused by the 1186 earthquake. All that remains of the original church are its foundations: the mock-medieval buttresses on its right-hand side were added in the late 19th century; at the same time the interior was also completely refurbished (Diocèse de Nîmes 2004–2010b). There is no remembrance of the 1186 earthquake in Saint-Quentin-la-Poterie. Rising high on a rocky outcrop on the other side of the plain, Saint-Siffret is considerably smaller than Saint-Quentinla- Poterie (991 inhabitants, according to the last census; see Annuaire des Mairies et Villes de France 2004–2011c) and— with its compact 12th century donjon, gate, and Romanesque church (closed)—it also preserves a convincingly medieval look. Three or four kilometers farther east, on the outskirts of the flat farmland and at a lower level than the previous two sites, lies the tiny village of Flaux (339 inhabitants according to the last census; see Annuaire des Mairies et Villes de France 2004–2011a), its buildings looking not older than the 18th century at most. The mayor of Flaux, whom we met by chance, was intrigued by our quest for a medieval earthquake that—she assured us—had left no remembrance at all in the community, as far as she knew. On the way back to Uzès we skirted Saint- Hippolyte de Montaigu, an even tinier hamlet than Flaux, made up of the same sturdy squared-stone 18th century buildings that in this case surround a 12th century church and bell tower. We did not stop in Uzès (8,602 inhabitants according to the last census; see Annuaire des Mairies et Villes de France 2004–2011d), knowing already that it would have been useless to look for earthquake memorials in the former cathedral (now parish church) of St. Théodorit. The extant edifice dates back to the mid-1600s, when it was rebuilt after having been totally destroyed at the start of the religious wars in 1563. The bell tower is all that remains of the church in which the Mass of Palm Sunday was sung on 5 April 1186 (Diocèse de Nîmes 2004–2010a). Grade of damage: 4 (to all/most houses). Uzès …factus est terre motus in Gothia in civitate que Uceticum dicitur† There was an earthquake in Gothia in the town called Uzès. Table 2 summarizes the process by which macroseismic intensity was assessed. As concerns the actual extent of damage, the more accurate information is reported for Saint- Quentin-la-Poterie, where most buildings collapsed or were seriously damaged; the degree of damage can be assessed as 4, and the estimated EMS intensity is grade VIII. Information about Flaux and Saint-Siffret is more or less the same: an unspecified level of damage that can be assumed as corresponding to grade 3; the EMS intensity can therefore be estimated as uncertain between grade VII and VIII. For Uzès, no explicit information on the effects is provided; adopting a conservative approach, we can hypothesize that, given its proximity to severely affected localities, Uzès must have undergone at least a modicum of damage, grade unknown; an EMS intensity could therefore be estimated as uncertain between grade VI and VII. Alternatively a generic mention of damage (D) could be assigned to Uzès (Figure 4). ▲ Figure 4. EMS-scale macroseismic intensity map of the 1186 earthquake (this study). The discovery of an earthquake previously unknown to, or undervalued by, the current catalogs is always a valuable improvement of the extant knowledge of the seismicity of a given area. In the present case, the improvement is particularly dramatic because the reappraisal of knowledge made possible by the analysis of a newly discovered earthquake record (Earthquake memorandum, 12th century) allows one to turn the faint trace left in the historical and seismological tradition by an obscure lesser seismic event into unquestionable evidence of a damaging earthquake. According to reliable contemporary evidence, the Uzège 22 March 1186 earthquake turns out to have been the strongest locally originated earthquake known to date to have occurred in the Gard department during the last millennium. Even if its magnitude cannot have been very large (more than 5 but less than 5.5 seems an educated guess), which prevents us from attempting to associate it to any known structure, the now-available evidence cannot fail to have some impact on the assessment of regional seismic hazard. On a more general level, the case history presented in this paper shows that there is still much margin for improving and detailing our general knowledge of the seismicity of the past. In recent decades, the centuries-old European seismological tradition has been revived, refined, and brought up to date thanks to the groundbreaking work of pioneers such as the late Jean Vogt, N. N. Ambraseys, and the efforts of many of their followers. Most of the work done until now, however, has been devoted to improving such knowledge as has been amassed in previous centuries by the great compilers of earthquake lists such as Mario Baratta for Italy or Alexis Perrey for France, Germany, the Netherlands, and other countries. However, as some recent studies show (Camassi and Castelli 2004; 2005; Castelli and Camassi 2005; Castelli et al. 2006), there is still ample room for improvement, particularly in those directions that our predecessors could not follow or did not think of following. Now it is time to leave the paths trodden by them and to strike out toward still-uncharted fields of historical earthquake investigation. We are grateful to Massimo Ceresa, Reference Librarian at the Vatican Library, who helped us to put the 1186 note into context; to Emanuela Ercolani for preparing the figures; and to Mme Nicole Perez, mayor of Flaux in 2010, for her appreciation of our quest. Last but not least, we want to thank Roger M. W. Musson, whose valuable advice helped improve this paper, as well as John Ebel for helpful suggestions, Jonathan M. Lees, and the SRL editorial staff. Benedict of Peterborough (12th century). Gesta Regis Henrici Secundi. In The Chronicle of the Reigns of Henry II and Richard I. A.D. 1169– 1192, ed. Wm. Stubbs, vol. 1. London: Longmans, Green, Reader, Dyer, 1867. Caffaro et al. (12th–13th centuries). Annali. In Annali genovesi di Caffaro e de’ suoi continuatori dal 1174 al 1224, ed. L. T. Belgrano and C. Imperiale di Sant’Angelo, vol. 2 Genoa: TipograFia del Regio Istituto sordo-muti, 1901. Centuriae Magdeburgenses (16th century). In Ecclesiastica Historia, ed. Matthias Flacius, Johann Wigand, Mattheus Judix, and Martin Köppe. Basel: Oporinus, 1559–1574. La Chronique romane (12th century). In Thalamus parvus: Le petit thalamus de Montpellier, ed. F. Pegat, E. Thomas, and C. Desmazes. Montpellier: J. Martel ainé, 1840. Chroniques de Saint Denis (11th–14th century). In Recueil des historiens des Gaules et de la France, ed. Dom Bouquet, vol. 17. Paris: Libraires Associès, 1757. Earthquake memorandum (12th century). In Codex Vaticanus Latinus 1972, MS Vat. Lat. 1972, f. 187b, Biblioteca Apostolica Vaticana, Città del Vaticano (Italy). Gervase of Canterbury (12th century). The chronicle of the reigns of Stephen, Henry II, and Richard I. In The Historical Works of Gervase of Canterbury, ed. Wm. Stubbs, vol. 1. London: Longmans and Co, 1879. Grandes Chroniques de France (15th century). In Royal 16 G VI ed. J. Viard. Paris: Société de l’Histoire de France, 1920–1953. Guillaume de Nangis (13th century). Chronicon. In Spicilegium, sive Collectio veterum aliquot scriptorum qui in Galliae bibliothecis, maxime Benedictinorum, latuerunt, ed. L. d’Achery, vol. 3. Paris: Montalant, 1661. Guillaume de Nangis (13th century). Chronicon. In Chronique latine de Guillaume de Nangis, de 1113 à 1300, ed. H. Géraud, vol. 1. Paris: J. Renouard, 1843. Ralph of Coggeshall (12th century). Chronica. In The Chronicles of Ralph Niger, ed. R. Anstruther. London: Caxton Society, 1851. Ralph of Diceto (12th century). Ymagines Historiarum. In The Historical Works of Master Ralph de Diceto, ed. Wm. Stubbs, vol. 2. London: Longmans and Co, 1876. Rigord (12th century). Gesta Philippi Augusti. In Oeuvres de Rigord et de Guillaume Le Breton. Historiens de Philippe-Auguste, ed. H. F. Delaborde. Paris: Librairie Renouard, 1882. Roger of Howden (12th century). Chronica. In Chronica Magistri Rogeri de Houedene, ed. Wm. Stubbs, vol. 2. London: Longmans, Green, Reader, Dyer, 1868. Wattenbach, W., and P. Jaffé, eds. (1888). Regesta pontificum romanorum ab condita ecclesia ad annum post Christum natum MCXCVIII, vol. 2. Leipzig: Veit et Comp, 822 pp. Alexandre, P. (1990). Les séismes en Europe occidentale de 394 à 1259. Nouveau catalogue critique, Brussels: Koninklijke Sterrenwacht van België, 267 pp. Boyle, L.P., (1972). A Survey of the Vatican Archives and of Its Medieval Holdings. Toronto: Pontifical Institute of Mediaeval Studies, 250 pp. Camassi, R., and V. Castelli (2004). 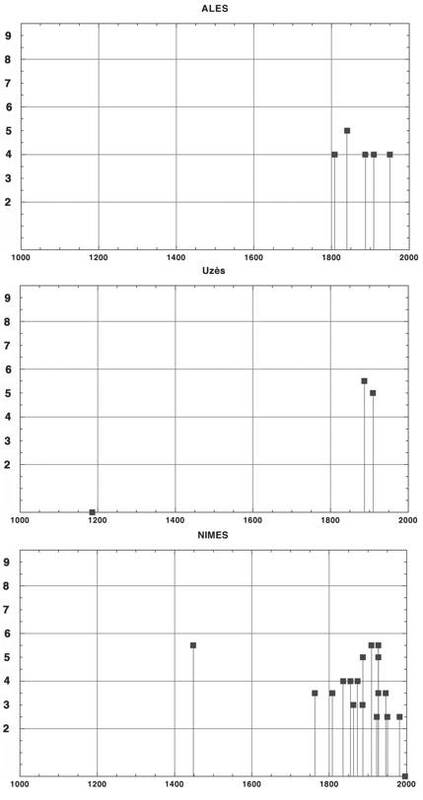 Looking for “new” earthquake data in the 17th–18th century European “newssellers” network. Journal of Earthquake Engineering 8 (3), 335–359. Camassi, R., and V. Castelli (2005). Journalistic communication in the 17th–18th centuries and its influence on the completeness of parametric catalogues. Bollettino di Geofisica Teorica e Applicata 46 (2/3), 99–110. Cappelli, A. (1983). Cronologia, cronografia e calendario perpetuo. Milan: Hoepli, 606 pp. Castelli, V., and R. Camassi (2005). The shadow-zone of large Italian earthquakes. Early journalistic sources and their perception of 17th–18th centuries seismicity. Journal of Earthquake Engineering 9, 333–348. Castelli, V., R. Camassi, and L. Postpischl (2006). “Here are lions”: Hunting for traces of unknown earthquakes around 15th–16th centuries AD. Proceedings of the First European Conference on Earthquake Engineering and Seismology, September 3–8, 2006, Geneva. Abstract Book, SC-A 1, 96 pp. Delaborde, H. F. (1884). Notice sur la vie et les ouvrages de Rigord, moine de Saint-Denis. Bibliotheque de l’Ecole des Chartes 45, 585–614. Dumaine, J. (2008). Bibliothèques et révolution française. In Le livre noir de la révolution française, ed. R. Escande, 261–282. Paris: Les Editions du Cerf. Germain, A. (1838). Histoire de l’église de Nîmes. Paris: Giraud Libraire- Editeur, 480 pp. Germer-Durand, E. (1868). Dictionnaire topographique du Département du Gard. Paris: Imprimerie Impériale, 298 pp. Grünthal, G., ed. (1998). European Macroseismic Scale 1998 (EMS-98). Cahiers du Centre Européen de Géodynamique et de Séismologie 15, 99 pp. Guidoboni, E. ed. (1989). I terremoti prima del Mille in Italia e nell’area mediterranea. Bologna: ING-SGA, 765 pp. Kibler, W., and G. A. Zinn, eds. (1995). Medieval France: An Encyclopedia. New York: Garland Pub., 1,047 pp. Lycosthenes, K. (1557). Prodigiorum ac ostentorum chronicon. Basel: H. Petri, 670 pp. Mallet, R., and J. W. Mallet (1858). The Earthquake Catalogue of the British Association. London: Taylor and Francis. Ménard, L. (1750). Histoire civile, ecclésiastique et littéraire de la ville de Nismes, vol. 1. Paris: Hugues-Daniel Chaubert. Nogara, B. (1912). Codices Vaticani Latini III: Codices 1461–2059. Rome: Typis polyglottis Vaticanis, 498 pp. Perrey, A. (1845). Mémoire sur les tremblements de terre ressentis en France, en Belgique et en Hollande dépuis le quatrième siècle de l’ère chrétienne jusqu’à nos jours. Mémoires couronnés et mémoires des savants étrangers publiés par l’Académie Royale de Sciences et Belles-Lettres de Bruxelles vol. 18, Brussels: M. Hayez, 110 pp. Provost, M., ed. (1999). Le Gard. Carte archéologique de la Gaule vol. 30/3. Paris: Académie des Inscriptions et Belles Lettres, 465 pp. Rigo, A., H. Pauchet, A. Souriau, A. Grésillaud, M. Nicolas, C. Olivera, and S. Figueras (1997). The February 1996 earthquake sequence in the eastern Pyrenees: First results. Journal of Seismology 1, 3–14. Scotti, O., D. Baumont, G. Quenet, and A. Levret (2004). The French macroseismic database SisFrance: Objectives, results and perspectives. Annals of Geophysics 47 (2/3), 571–581. Susplugas, M. (2010). Uzès. Nîmes, France: Editions Alcide, 142 pp. Venturini, A. (2006). Les cartulaires des anciens évèchés d’Uzès et de Nîmes. In Les cartulaires meridionaux, ed. D. Blévec, 21–31. Paris: École des Chartes. Vic, C. de, J. Vaissete, and A. Du Mège (1842). Histoire générale de Languedoc vol. 5, Toulouse, France: J.-B. Paya, 924 pp. Volant, P., A. Levret, D. Carbon, O. Scotti, D. Combescure, T. Verdel, A. Plant, and P. Laurent (2009). 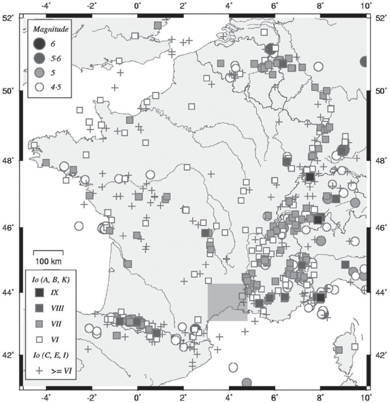 An archaeo-seismological study of the Nîmes Roman aqueduct, France: Indirect evidence for an M > 6 seismic event? Natural Hazards 49 (1), 53–77. Annuaire des Mairies et Villes de France (2004–2011a). Flaux; http://www.annuaire-mairie.fr/. Last accessed 14 October 2011. Annuaire des Mairies et Villes de France (2004–2011b). Saint-Quentinla-Poterie; http://www.annuaire-mairie.fr/. Last accessed 14October 2011. Annuaire des Mairies et Villes de France (2004–2011c). Saint Siffret; http://www.annuaire-mairie.fr/. Last accessed 14 October 2011. Annuaire des Mairies et Villes de France (2004–2011d). Uzès; http://www.annuaire-mairie.fr/. Last accessed 14 October 2011. Diocèse de Nîmes (2004–2010a). Patrimoine-Culture: Cathédrale Saint Théodorit, Uzès; http://nimes.catholique.fr/fiche_patrimoine.php?ID=9. Last accessed 19 October 2011. Diocèse de Nîmes (2004–2010b). Patrimoine-Culture: Saint- Quentin-la-Poterie; http://nimes.catholique.fr/fiche_patrimoine.php?ID=22. Last accessed 1 October 2011. Ghellinck, J. (1911). Peter Comestor. In The Catholic Encyclopedia. New York: Robert Appleton Company; http://www.newadvent.org/cathen/11763b.htm. Last accessed 1 October 2011. NASA (2009). Partial solar eclipse of 1186 April 21. NASA eclipse website; http://eclipse.gsfc.nasa.gov/SEsearch/SEsearchmap.php?Ecl=11860421. Last accessed 19 October 2011. NASA (2011). Five millennium catalog of lunar eclipses: 1101 to 1200. NASA eclipse website; http://eclipse.gsfc.nasa.gov/LEcat5/LE1101-1200.html. Last accessed 19 October 2011. Pélaquier, E. (2007) Atlas historique de la province de Languedoc. CNRSCRISES Université Paul Valéry-Montpellier III; http://archives.herault.fr/atlas-historique-du-languedoc-114995.html. Last accessed 1 October 2011. Plan Séisme (2011). Zonage sismique de la France. Le Plan Séisme. Un programme national de prévention du risque sismique. Bureau de Recherche Géologique et Minière (BRGM); http://www.planseisme.fr/Zonage-sismique-de-la-France.html. Last accessed 18 October 2011. SisFrance (2010). SisFrance: Histoire et caractéristiques des séismes ressentis en France. Site de la base de données historiques nationales présentée par le Bureau de Recherche Géologique et Minière (BRGM); http://www.sisfrance.net/. Last accessed 16 October 2011.